TomoView is a PC-based software for data acquisition and visualization of ultrasonic signals. TomoView™ is PC-based software used for design, data acquisition, and visualization of ultrasonic signals. Ultrasonic parameter configuration is flexible, displaying different types of views. This ensures it can be used in a large variety of applications, from industrial to research. 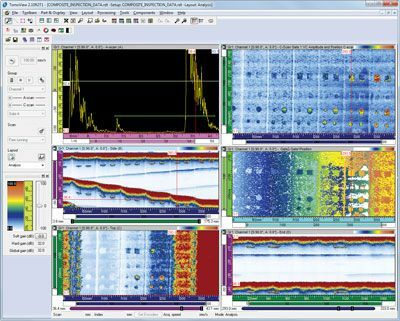 TomoView is designed to perform ultrasonic testing (UT) data acquisition with several Olympus phased array (PA) or Conventional UT units, giving you the flexibility to choose the configuration for your application. Compatible with Microsoft Windows, XP, Windows Vista, and Windows 7, TomoView can operate efficiently on standard laptop computers as well as on high-end desktop workstations, and it can handle large data files (up to 2 GB). TomoView has advanced simultaneous multitechnology capabilities, giving you the power to perform Conventional UT, Phased Array (Pulse-Echo, Pitch-and-Catch, or Through Transmission) and TOFD acquisitions. When you use TomoView for your ultrasound inspection applications, you have the power to build YOUR application, YOUR way. The TomoView™ Advanced Calculator is an essential and powerful component of the TomoView software package. This calculator easily and precisely programs angle beams and focal points for 1-D Linear array, 1-D Annular array, and 2-D Matrix array probes, with its preprogrammed wedge, probe, and material database. The Advanced Calculator can be used to program sectorial, linear, and depth scan focal laws for plane and circular geometries, supports dynamic depth focusing (DDF), and can also be used to generate OmniScan™ compatible law files (.law). In addition, the graphical display of the resulting beams and angle beams provides you with an important validation tool. The Acoustic Field Simulation Module is available as an option, offering the simulation of spatially diffracted fields in 2-D or 3-D.
Up to 64 elements per focal law with the FOCUS LT 64:128 and 64:64 models, offering improved defect definition, material penetration, and flexibility for 2-D matrix and 2-D dual-matrix probes. Advanced R-O configurations, with the power to pulse and receive using different element configurations. High PRF for applications requiring fast inspection speeds. DDF feature for highly improved resolution while maintaining an optimized inspection speed. Manage up to three FOCUS LT units in parallel using TomoView, while benefiting from up to a threefold increase in acquisition speed. TomoView offers complete flexibility when building layouts, with fully configurable view displays and readings. Each set of views maintains its own content configuration, and easily transferred to other views, and then saved to layout sets that remain accessible through the TomoView manager. In addition to offering a wide choice of readings, all readings can be easily exported to Microsoft Excel, processed using custom calculations, and then imported back into TomoView. This allows you to create custom readings, and import these readings directly in the TomoView interface. TomoView Manager is arguably the most useful of the TomoView components, giving quick and easy access to the most frequently used commands. It can be used to quickly add, remove, or modify groups, and allows you to easily switch between different groups and gates. It also provides an interface that easily changes the global gain, as well as the A-scan and gate parameters. Flexible and fully configurable layouts are a fundamental element of TomoView. They allow you to view data in different representations in order to best serve your application needs. TomoView comes with multiple sets of useful predefined layouts. TomoView allows you to go further by creating your own layouts that can be easily modified, saved, and loaded for rapid retrieval during inspection or analysis. The individual views also can be customized through contextual menus for an additional layer of flexibility. In applications where focal configurations are maximized to obtain the highest inspection speed, the TomoView Firing Sequencer module allows you to modify the order in which the focal laws are triggered. This helps to diminish the ghost echoes which tend to appear in these conditions. DDF at left and standard focusing at right. The Dynamic Depth Focusing (DDF) technique dynamically changes beam forming on reception for increased resolution, therefore allowing improved defect resolution while maintaining optimal inspection speed. The Conditional A-scan allows the A-scans to be recorded only when an alarm is triggered. This allows the A-scans to be contained only in the areas where this information is important, allowing the user to inspect much larger areas in a single inspection. In addition to being powerful design and acquisition software, TomoView also includes the most advanced analysis tools from Olympus NDT, allowing in-depth comprehension of the acquired data. This makes TomoView the ideal companion for analysis and reporting. Whether you want to perform simple flaw sizing and reporting, or to go deeper in your analysis, TomoView has the power to do all of this and much more with its flexible and comprehensive design. With many new functions, TomoView 2.10 is now more than ever the best tool to take your analysis to the next level. Maximum data file size has been increased to 2 GB, allowing you to merge data from multple files and analyze data from larger surfaces more efficiently. Volumetric merge for improved data representation and effective analysis of multiple volumetric views in combined displays. With its advanced analysis algorithms, TomoView 2.10 allows you to go even further with your acquisition data. Powerful noise-analysis feature allowing you to quantify the signal-to-noise ratio and obtain more information about the inspection conditions. Comprehensive matrix filters feature allowing better C-scan data representation in noisy environments. TomoView's data file merging feature allows multiple data files to be combined into a single file, and then analyzed simultaneously, making the analysis process much more efficient. TomoView 2.10 also allows up to 2 GB per data file, giving you the power to combine even more data files into a single one than before. The C-Scan merge feature allows data from different C-scan patches to be merged in a single C-scan, where either the maximum or minimum amplitude or positions detected over the different C-scans are retained. TomoView Volumetric Merging feature allows different acoustic beams to be merged in a single group, therefore providing a clear representation of the entire inspected part, making indication analysis much easier. When spatial overlap occurs, the maximum amplitude is conserved. The merged view therefore shows all detected indications regardless of the original indication orientation. Note that the indicators can differ due to the merge resolution used. The Matrix Filters tool can be used to reduce noise on C-scan data by processing data points using the surrounding points. The Matrix Filters are particularly useful when analyzing noisy composite parts, therefore allowing clearer data representation for analysis of data files with high noise levels. TomoView includes a signal-to-noise ratio (SNR) function. You can use the SNR Analysis Utility to evaluate the noise level in a reference area on a C-scan view, and then to calculate the indication surface area above the noise. The SNR function is available in Analysis mode and with the Lite Aero edition. The SNR function is used for 0-degree inspections, often for aerospace industry parts. You can use the function on Top (C), amplitude, and position C-scan views. Using the Software C-scan Editor which now allows custom geometries to be edited from the originally acquisitioned data, the zone of interest can be customized in analysis, therefore giving you much more flexibility when inspecting complex geometries. The Binarizer tool can be used to perform simple pass or fail analysis on data files by converting acquisition data to a color driven "Good/No good" display. This tool is particularly useful in situations where visual analysis of the acquired data is required in the inspection procedure. Creating a report in TomoView™ has never been easier. Use the Zone tool to add an indication. Select your preferred indication table template (easily customized with additional readings and comments). Click Add. Repeat for all relevant indications. Changing company logos and adding inspection specific information (operator's name, site, part, etc.) can be done very easily, and a full html report including all relevant inspection settings can be created in a matter of seconds. Once completed, indication tables are automatically saved in an .R01 file format, to be later uploaded into TomoView. TomoView was designed to be a flexible tool meeting your expectations for many applications. In order to be the best suited tool in a world where requirements vary greatly and evolve rapidly, the NDT Remote Control and NDT Data Access Libraries were created in order to give you the power to make TomoView the perfect companion for your application. Both libraries are based on a COM interface, which allows you to perform related functions using different software environments (Microsoft Visual C++, Microsoft Visual Basic, LabVIEW, C#, MATLAB). By combining the flexibility of the NDT Remote Control Library and the usefulness of the NDT Data Access Library, you can adapt TomoView to be the tool that you need to build your application. TomoView and the libraries give you the perfect tools to build flexible train wheels and axles inspection systems. Powerful overhead scanners can be interfaced with TomoView and the libraries to inspect components with complex geometries. With the data file size increased to 2 GB and conditional A-scan functionality, inspecting very large parts without making multiple acquisitions is possible. The NDT Data Access Library is a software development kit, which allows you to read data files using a custom application. It is especially useful in applications where it is required to visualize and process data acquired using Olympus instruments with custom procedures. The Data File Access Library provides high-level access to data that normally prevents users from dealing with the complex architecture of the data files. Data and parameters related to data interpretation can be easily read (refracted beam angles, velocity, delays, offset, etc.). The NDT Data Access Library offers direct access to the raw acquisition data from the source data file, allowing you to retrieve the amplitude, position, and thickness values acquired during the acquisition. The NDT Data Access Library also allows you to retrieve the most important inspection parameters, therefore giving you the power to process and represent them based on your requirements. The NDT Remote Control Library is a software development kit, which allows you to develop a special user interface for automated inspections using Olympus NDT instruments (phased array or conventional UT). From an external computer, the library can be used to directly control the TomoView™ software, offering a wide range of possibilities in both inspection and analysis modes. Using the NDT Remote Control Library, you can create a custom program which can be used to send remote commands to TomoView. These commands can be used for on-the-fly setup modification as well as process optimization. These remote commands can be sent from a local or remote computer. An open access is given through the RCLIB to the most commonly used features in acquisition and analysis. The TomoView window can be directly embedded in any custom programmed frame, allowing you to create your own interface in which TomoView will be integrated. You can access the interface directly by clicking in its window. With the advanced flexibility of the TomoView display, integrate only the panes containing the data that you want to present, therefore making the integration flawless. The NDT Remote Control Library can also be used to obtain direct access to the live acquisition data, thereby allowing you to make custom processing or storage procedures directly from the raw data. This feature can also be used to create custom alarm triggering criteria which can be easily interfaced with your system components.